"It's A Southern Thing", is Country Music with a history lesson! Rick Revel, has been involved with American Heritage Preservation almost as long as he has been singing and writing songs. After nearly four decades of being a dedicated musician and heritage preservationist of the Civil War, for him to write an entire album from a Southern view point was inevitable. With the heightened interest in the Civil War during the 150th anniversary period, what better time to get the message out on Southern Heritage. Referred to in the South as the War of Northern Aggression or the War for Southern Independence, many who have Confederate Veterans in their family tree, feel their ancestors are mislabeled when called traitors. In fact, most Confederate soldiers felt they were following in the footsteps of the Founding Fathers of our Country as they marched off to war. The intent of this CD, is not to incite prejudice or re-open old wounds, but to inspire a new sense of pride in Southern Heritage and to educate the uninformed of a very misunderstood and misrepresented era. Think of it as, "Country Music with a history lesson!" Confederate General Patrick Cleburne spoke these eloquent words on January 2nd, 1864, "...every man should endeavor to understand the meaning of subjugation before it is too late. We can give but a faint idea when we say it means the loss of all we now hold most sacred...personal property, lands, homesteads, liberty, justice, safety, pride, manhood. It means that the history of this heroic struggle will be written by the enemy; that our youth will be trained by Northern school teachers; will learn from Northern school books their version of the War, will be impressed by all influences of history and education to regard our gallant dead as traitors, our maimed veterans as fit objects for their derision, it means the crushing of Southern manhood...to establish sectional superiority and a more centralized form of government, and to deprive us of our rights and liberties." No greater prophetic words have ever been spoken. On August 2nd, 2008, Rick would sing his song "It's A Southern Thing", to the public for the first time. 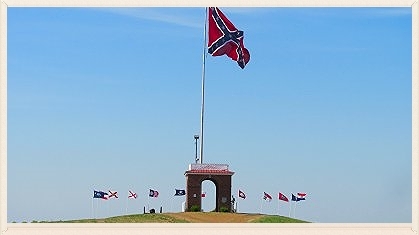 The event was for the raising of a twenty x thirty foot Confederate Flag at Parks Cemetery Ridge Memorial Plaza in Trimble, TN. The standing ovation from the tearful audience was Rick's signal to complete this album.